Trampolines for adults There are 23 products. 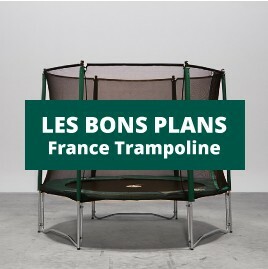 Waouuh 460 octagonal trampoline with safety enclosure. Offers outstanding jump performances. Its unusual shape will let the whole family perform sequences of complex technical figures. Apollo Sport 500 Rectangular Trampoline Maxi Pack with safety net, step-ladder, protective cover, and anchoring kit. For athletic use. Waouuh 390 octagonal trampoline maxi-pack with safety enclosure, including step-ladder + protective cover + anchoring kit. Ideal for elaborate jumps. The biggest trampoline in the Waouuh range with a diameter of 4,57 m.
Waouuh 460 octagonal trampoline maxi pack with safety enclosure, step-ladder, protective cover, and anchoring kit. An octagonal trampoline for powerful jumps. A compact octagonal trampoline which combines strength and power for family and sports use. Waouuh 360 octagonal trampoline maxi-pack with safety enclosure, including step-ladder + protective cover + anchoring kit. Designed for intensive use. An octagonal trampoline for maximum bounce. The Waouuh 430 trampoline maxi pack is provided with a safety enclosure, a ladder, an anchor kit and a premium protective cover. Mini fitness trampoline at a low cost.